Death, taxes, horror sequels, reboots, re-imaginings, prequels and shot for shot remakes. There are a few things we can expect in this world and taking a beloved horror property and running it into the ground is one of them. Horror franchises are like a large family full of vengeful sharks, skin mask wearing butchers and ridiculously evil brothers. There are always one or two people that are problematic and often completely left out (or imprisoned). However, when family photo time comes around the entire family needs to be in the photo (think the Alien Quadrilogy). 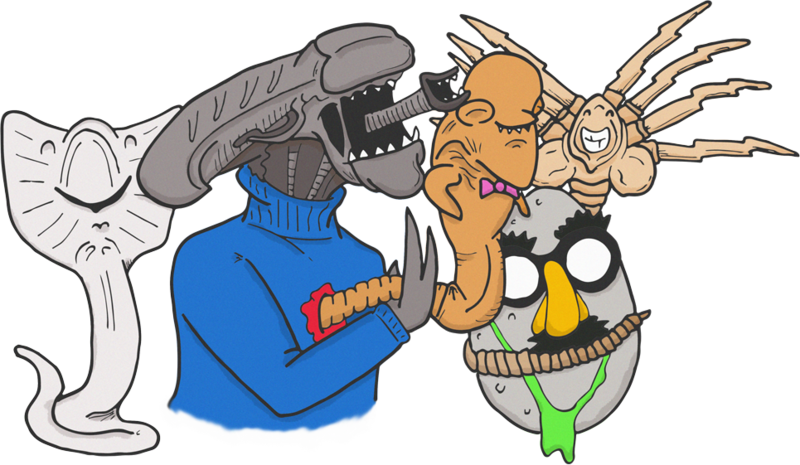 Thank you Jake Sauer for the Alien family photo. Gotta love the Prometheus critter who wipes out the dumb scientists. The point of this post is to introduce the Movies, Films & Flix Metrics system (MFFM) and take an in-depth look at complete horror series. I want to know which horror property with all its bumps and bruises holds up the best. My data wrangling cousin Jeremy (who broke down the data for the totally necessary/unnecessary explosions on movie posters post) broke down critical/audience/box-office scores and worked his wizardry to compile the most comprehensive horror series evaluation ever (I think). Here are criteria for the data wrangling and number analysis. The franchise needs to have at least four theatrically released films (Jaws I-III, Jaws: The Revenge). Compiling box office data on direct to DVD movies (Puppet Master etc..) isn’t possible and the data would be unreliable. Click here to see all the franchises that make up the list. I took sequels (Texas Chainsaw Massacre 2), remakes (The Texas Chainsaw Massacre) and prequels (Texas Chainsaw: the Beginning) into account. I also added the Romero Zombie franchise and the Hannibal films because they feature the same world, characters and cannibals. The post will look at return on investment (ROI), highest average per franchise and which series averages were the highest after the first film. For instance, we all know The Exorcist made a lot of money. I want to know how the other Exorcist films did in comparison (not well). Critical/audience data was collected from Rotten Tomatoes, IMDb and Amazon. Metacritic did not have enough data so we excluded it from the MFFM. I am looking only at domestic box office and had to leave out several international series due to lack of data.The toughest omission was the [Rec] series. 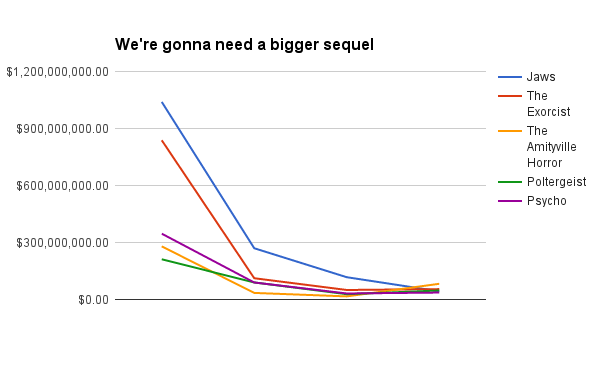 I also had to leave out the Universal Monster franchises because there is a lack of consistent box-office data. Viva la Bride of Frankenstein though! A Quick Note: Child’s Play, Hellraiser and The Night of the Living Dead series had at least one film go direct to DVD. I could not find reliable box-office for them so we decided to leave them out. Without further ado, here are the top horror series according to the MFFM and its breakdown of box office and critic/audience data. If you’re interested in the data you can read about how Jeremy came up with the numbers. And the most groovy franchise is! Ash is going to become an even bigger blowhard after he hears this. With a 64.2 MFFM average The Evil Dead franchise ran away with the win like a Deadite sprinting from an out of control war car. It conquered the field with a combination of critic/audience love (Sam Raimi is the best) and it is the only series to have box office tallies that nearly doubled from film to film (Started with $6 million then collected $12, $22, $55.). No other franchise can boast this accomplishment and if you check out Evil Dead’s rise in comparison to Mr. Pinhead and his first four Hellraiser films you will be impressed. 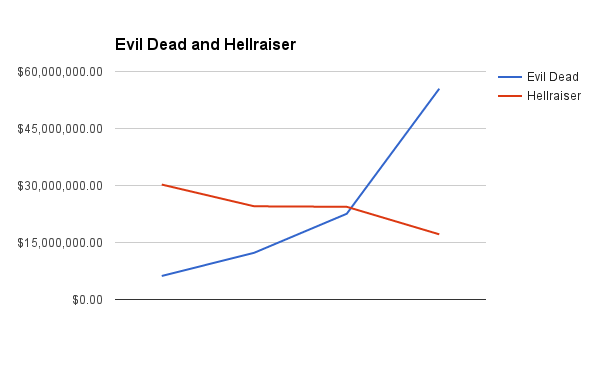 Even if you look at the first four films of every horror series their box-office doesn’t resemble Evil Dead’s climb. The only series that comes close is Nightmare on Elm Street. The first four films gained box-office ($59, $66, $93, $97) until it fell off with the fifth entry ($45). However, the climbs weren’t as dramatic and eventually the dream wheels fell off. Evil Dead has the highest Critical (81.5) and Audience scores (77.25) to go along with with the rise in box office. A cool fact is that Evil Dead 2 (1987) has a higher critic/audience score than Evil Dead (1981). The only other horror sequels to do this are Aliens, Scream 2, Piranha 3D and Final Destination 2,3 & 5. Another cool fact about The Evil Dead franchise is that it is the highest customer rated horror series on Amazon (84.5). Consumers love Evil Dead and its endless barrage of special edition DVDs (Hello Boomstick Edition in a primitive screwhead steelbook case). Evil Dead’s ROI was not the highest and the average ($24,129,525) doesn’t compare with the bonkers ROI/averages of Paranormal Activity or The Texas Chainsaw Massacre franchises. However, it is second highest in series box office averages compared to the original (+23,000,000). The only four series to have positive averages compared to the original are Hannibal (+140), Evil Dead (+23), Nightmare on Elm Street (+13) and Resident Evil (+2). The positive average over the original is important because it proves the series has legs and a chainsaw arm. Many horror series had massive first films (Exorcist, Jaws, Psycho, Alien, Poltergeist, Texas Chainsaw Massacre, Halloween, Amityville Horror, Poltergeist) then suffered from box office declines with each subsequent film. Their overall averages may be buoyed by big first installments but successful franchises improve or hold their budgets. The only negative of the Evil Dead series is that Army of Darkness only made $12.5 million on a $13 million dollar budget. Making up for the $500,000 loss is the fact that AoD has the highest critic/audience rating of any third franchise film (80.25). It beat out stalwarts like Day of the Dead (78.25) and Nightmare on Elm Street: Dream Warriors (72). Critics and audiences love Ash and the fact that he can’t remember three words to save a kingdom. Fede Alvarez’s The Evil Dead (2013) had the fifth highest MFFM score amongst remakes and ranked #2 behind Dawn of the Dead as the highest critic/audience rated franchise remake. It is one of three remakes (NOES, Dawn of the Dead) that made more than the original and it has the largest box office percentage over the original (8.9). It is the rare remake that doesn’t feel like a shiny recreation of the first film. It has glorious practical effects and switches the hero effectively. There are franchises (NOES, PA, Friday the 13th, Saw, Hellraiser, Omen) that made their budgets back every time. However, their steep declines from film to film and low critic/audience scores can’t buoy them in the long term. Evil Dead has proven itself to be ingrained in the zeitgeist (can’t wait for the show) and gives the viewer the best bang for their buck. Sam Raimi and crew deserve a round of applause because they created an unstoppable Juggernaut. Vote and let me know your favorite franchise! I will post the results next week so make sure to follow MFF on twitter (@MoviesFilmsFlix) or Facebook! Thanks for reading! I always have, and will be, a mega fan of the evil dead franchise. Every movie that is made from that series is amazing. I am really looking forward to part two.